David, I'm speechless! What a great collection! 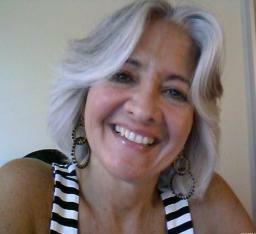 LIke a woman who refuses to wear one particular style of clothes (he, he, that would be me! :-), you moved around a full array of bread types... awesome! It was fun: my second challah, first time for bagels, and the baguettes are my go-to Overnight Baguettes formula. Ain't flour and yeast grand?! What a great range of breads, David. Coming from a professional, that's very encouraging. Especially the two-tiered challah. I'm trying to get that result with a brioche but haven't got quite the proof you've obtained. Very nice! I made the entire dough into one loaf. It weighs 2.5 lbs! I don't think I'll do that again. We cut into thirds, and froze two pieces; finished the last of the other third this AM made into French Toast. A little stale, it was perfect for it. Your 2nd time making challah? Your 2nd time making challah? Amazing. I've made challah often, but haven't really had the time or patience to master the braiding. You have inspired me. I learned to do three and four braid, helping my sister fix her hair, and making lanyards at camp. I got so good at making lanyards, that other campers would pay me to make one for them. I guess learning dough braiding came naturally, but I must admit the six-braid is challenging. This one is a three braid, on top of a five-braid ala Ciril Hitz. Give it a shot, Even if you goof it will taste good! I've learned a lot in the last year, and I've had fun doing it! David, what a gorgeous spread of baking! Congratulations on your lovely work! when I saw it I went Ooosh wow a beauty. 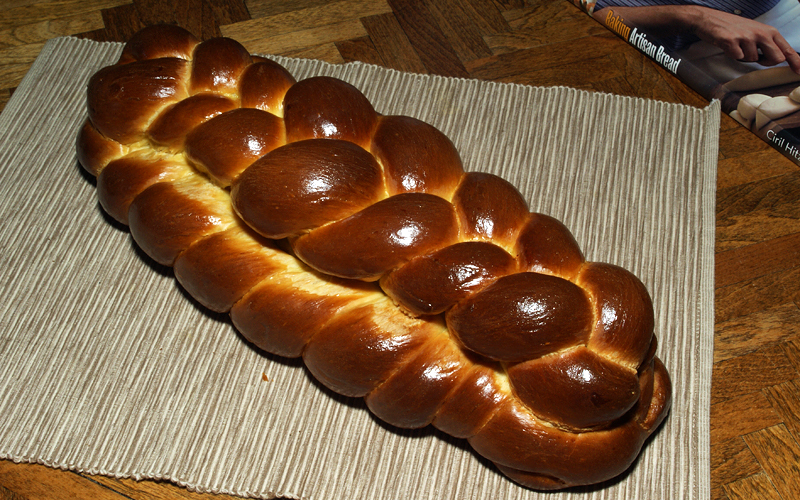 I considered trying savory stuffed braids, like your work inspired, in the challah. Being only the second one I've baked, and wanting to try Ciril Hitz' double-decker loaf, I opted not to. However, I think #3 will have a feta-spinich lining. for your second challah it is perfect. What a beauty! You'll probably find filling the challah is not nearly as difficult as it looks..just filled rectangles folded over and sealed, some adjusting/rolling to the ropes then braided. Spinach makes a super filling with added cheeses, nuts and yummm in a tort or deep dish pizza or just about anywhere...just be sure and wring it good after sauting it as it tends to be very watery. Great job on all three baking days. They all look perfect. 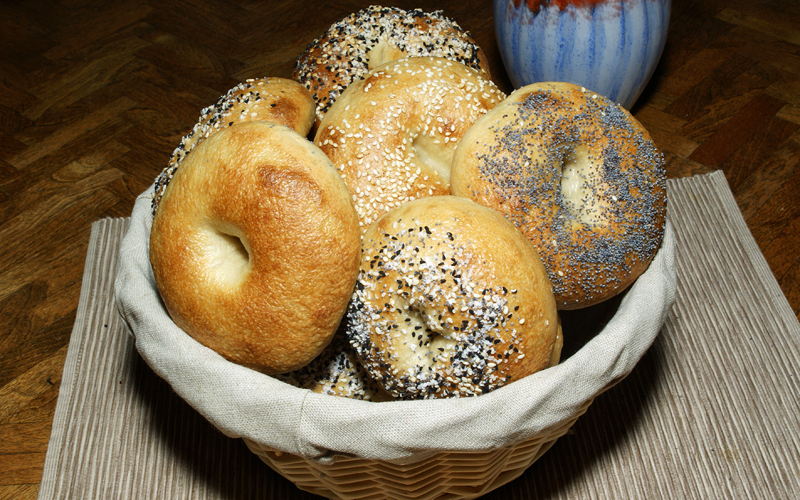 Whose bagel recipe did you use? I used BBA's formula, but the techniques were borrowed both from Reinhart's BBA, and Hamelman's Bread. I especially like the ice-bath technique. Not only does it stop any cooking immediately following boiling, but it makes the bagels easy to handle. I also didn't retard them overnight, ala BBA, but only for six hours ala Hamelman's minimum time. 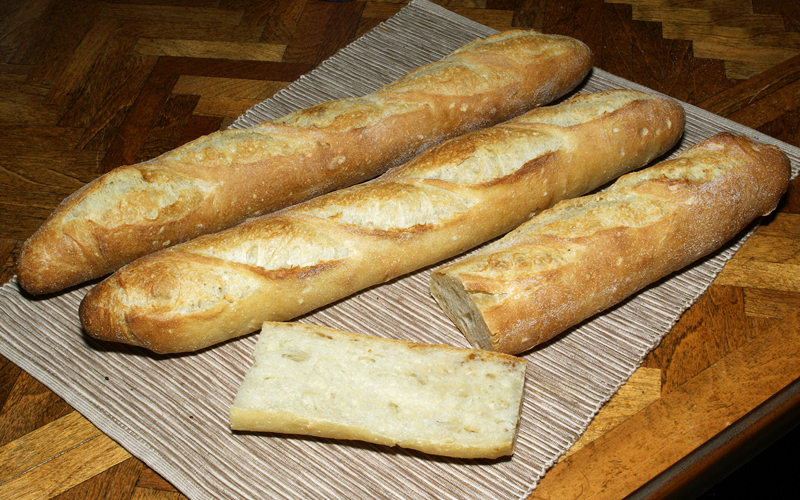 That was mainly because I intended to do the baguettes early Sunday morning, whose dough gets retarded for fifteen hours. I didn't have enough high-gluten flour--I can only get it online--so half the flour was KA bread flour. (Reinhart directs either high-gluten or bread flour) Nonetheless, the crust and crumb textures are chewy enough that my wife asked I not make them any chewier. Since I made them especially for her, I'm sticking with the half-and-half flour mixture for the future. Now that's my kind of weekend! The challah is just beautiful. What a gorgeous burnished brown colour. I make challah every week. I put a topping on it, with flour sugar and butter (or margarine). It is yummy. The bagels look wonderful. I also use PR's recipe but have never tried the ice water technique from Hamelman. I'll have to check it out. The baguettes are pretty stunning too. Tell your wife she is a lucky woman! It's beautiful, particularly the braided challah. Did you just put the three-strand braided loaf on top of the five-strand? Did you need to put anything, i.e. eggwash or milk or whatever on the 5-strand in order for the three-strand to stick? Three and five strand is less complicated than the six strand method and I'd love to try it out one day. Make the five and three braid separately. Using a dowel or a small diameter rolling pin--I used my wood pastry rolling pin, about 2" in diameter--make a depression down the center of the five-braid loaf just the width of the three-braid loaf. I didn't wet the joining surfaces with anything; they adhered during final proofing perfectly. You can see the joint in the crumb, but it doesn't pull apart easily.